Looking for a compact stacker for handling different pallet sizes? Our BT Staxio HWE is a lightweight powered stacker truck with adjustable straddle forks can handle a variety of pallet sizes. With a load capacity of one tonne, this stacker is suitable for a variety of applications and provides simple as well as safe pallet movement and enhanced manoeuvrability. A photocell monitors the top of the load to automatically keep it at the same height as items are moved on and off. Suits all kinds of applications. This model can handle a variety of pallet sizes thanks to its adjustable straddle forks. Features a built-in charger for fast and easy charging – just plug it into a power socket. This truck is equipped with PIN code access, individual parameter settings and automatic shut-off for safe operation. When starting uphill or in an inclination, the forward travel mode can be selected without any risk of the truck rolling backwards when the brakes are released. The revolutionary low-maintenance AC motor offers durability and strength, as well as low energy consumption. The standby mode cuts off most energy-consuming components. And a smart charger gives you an increased battery lifetime. 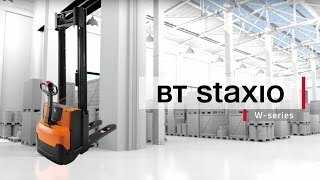 Designed for light-duty stacking operations and easy horizontal pallet movements, these BT Staxio W-series are easy to use. Its compact design and manoeuvrability make the HWE models fit to use ​​​​​​​in a wide range of applications, such as shops. This truck is equipped with telematics hardware, making it a smart truck that can be connected. This allows you to easily monitor its activity and improve its productivity, safety and efficiency. The HWE100S has support arms that straddle the load allowing an adjustable fork width. The support arm width can also be easily adjusted if the requirements of the application change. It is light enough to be used on mezzanine floors and are ideal for low-intensity use in public environments such as shops and hospitals, especially with the low noise level generated by the truck. Built-in charger for fast and easy charging. Excellent visibility for safe goods handling. Individual operator parameters: maximum speed, acceleration and braking behavior can be adjusted to suit individual needs. Like all Toyota trucks, BT Staxio trucks are built according to the Toyota Production System, assuring the highest levels of quality, durability and reliability.